I have the first page of Jax’s Quiet Book finished! This page was inspired by Handmade by Jill’s rocket page and the fact that Jax’s grandpa was a rocket scientist (astrophysicist.) I created a pattern as I worked on this page, and I’m sharing it with you all for your personal use. If you use the pattern, I’d love to see it! Link back to me or leave a comment! The page is designed to learn how to work zippers. 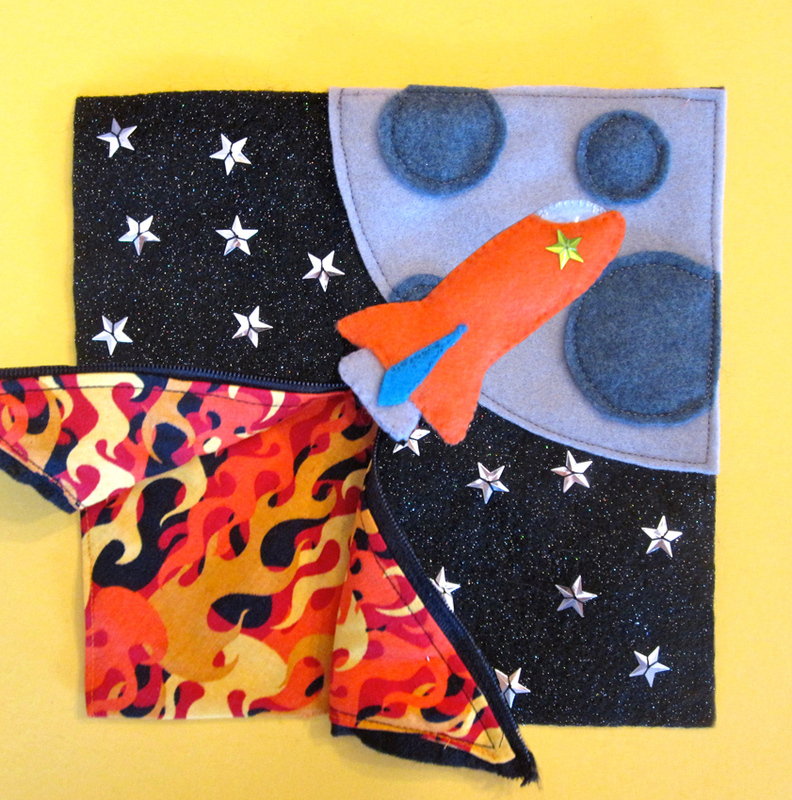 There is a hand-sewn felt rocket ship attached to a zipper. 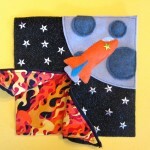 When the rocket soars towards outer space, the zipper opens to reveal flames. I did use star sequins in this design, but you can leave them out or replace them with felt or embroidery if you have a young baby who puts things in their mouth. Whatever works best for your situation! My other materials were: felt sheets (black glitter, dark gray, light gray, orange, turquoise and light blue), matching threads, batting/stuffing, a scrap of clear vinyl to make the window shiny, 7″ black zipper and a scrap of ribbon ton attach the rocket to the zipper pull. It’s all pretty self-explanatory from the pattern and photos, but the flames are a little tricky. 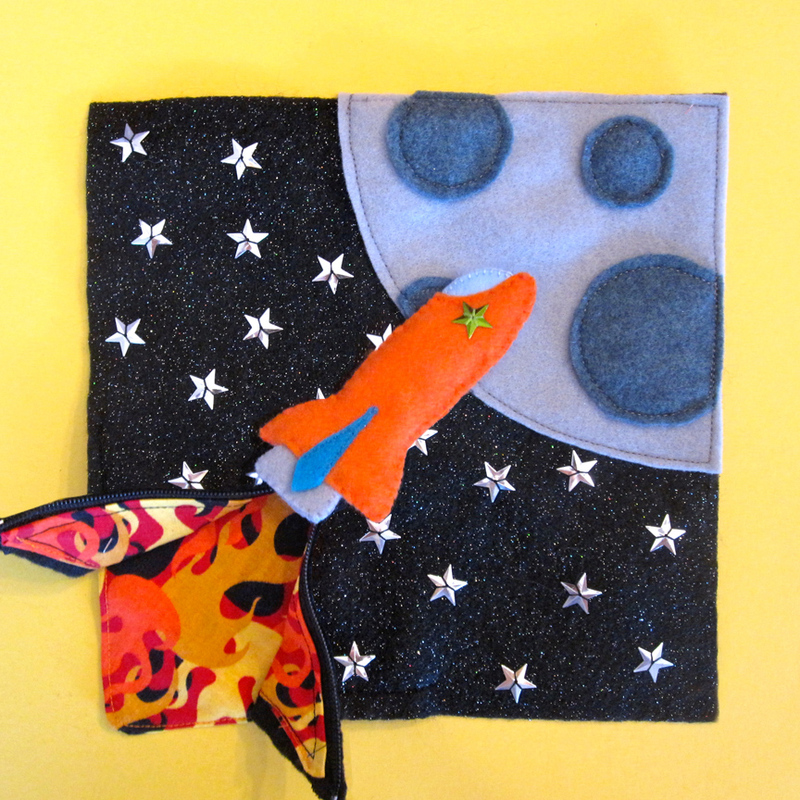 Here’s what I did… I sewed the rocket together with some batting to make it dimensional. I decorated the moon with craters. To add the zipper, I pinned it face down onto the back of my black felt then sewed it with a zipper foot. On the front of the page, cut the felt open up the center of the zipper to make the opening. Sew down your decorated moon to cover the top of the zipper opening. 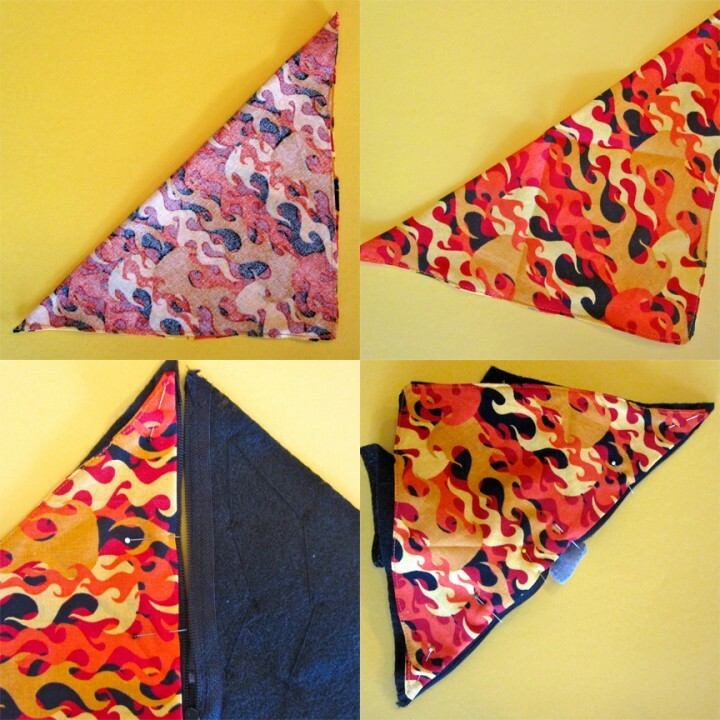 For the flames: Fold the 10″ square into a triangle, right sides facing, press and sew (leaving a hole to turn it right-side-out.) Note that my square was a little too small so my seam allowance is tiny and it came out wavy. Learn from my errors! Turn the triangle right-side-out and press the hole shut. Top stitch all the way around, closing the hole. The triangle will get folded like origami so that the two outer points meet down at the bottom point when the zipper is closed. I pressed mine like this before moving on. Unzip your zipper and pin one side-corner of the triangle to the back side of a lower corner of the page, leaving room so you don’t sew through the zipper. Repeat for the other side. You will have to fold up the page a bit to get both sides pinned, and there will be an inch or so crossing the zipper that can’t be pinned/sewed. It will be hidden behind your page once you put on a backing or another page (unless your zipper goes up really high! I tested mine with the pins before sewing.) Sew each side separately, then you’re done! Jax is already really excited about the page, but he can’t practice unzipping until I put it into the book. 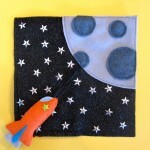 I am halfway done the facing page – a spaceman – so check back this week for that free pattern! What do you think of my first page? This entry was posted in Crafts, Quiet Book, Sewing and tagged Free, Patterns, Quiet Book, Sewing on September 4, 2011 by Stephanie. Hi! 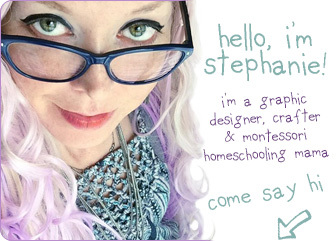 I am attempting to make your adorable quiet book. I am doing the rocket ship page and can’t fully grasp how you attached the zipper. Is it between the layers of flame fabric and felt? How di you attach the ribbon to the zipper and then to the rocket to make it open easily? Where did you find your flame fabric? I got the fabric at Joann’s. 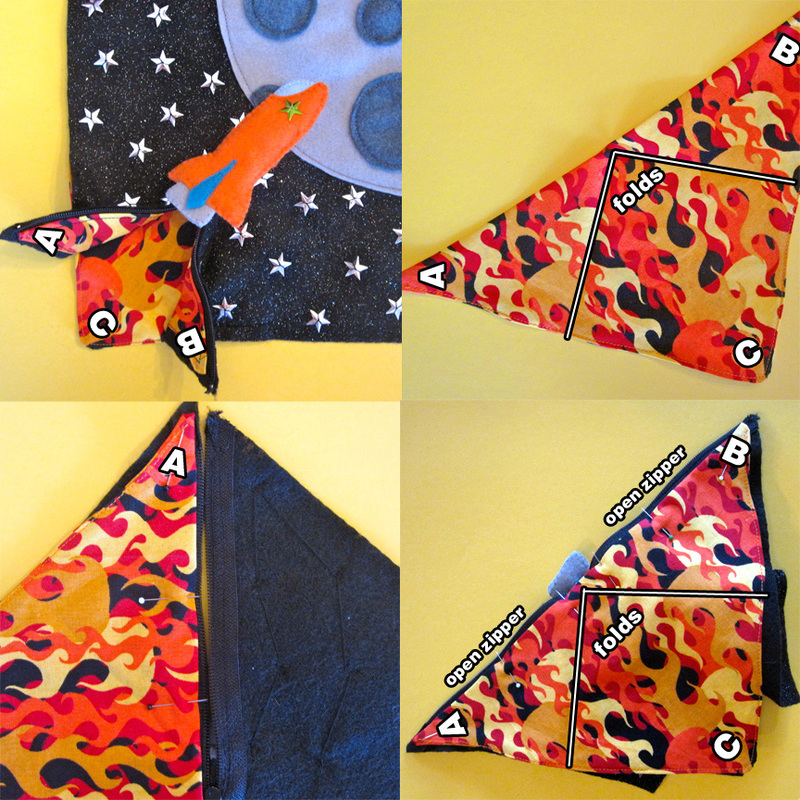 When both the rocket and the page were sewn, I threaded a loop of ribbon through the hoe in the zipper pull and stitched the loop to the back of the rocket. You do need to hold down the corners of the felt with one hand when you start unzipping. I’d thought about adding snaps to those loose corners, but Jax will need to learn to hold the bottom of his coat when he is zipping up anyway. To add the zipper, sew it face down onto the back of your felt, then cut the felt up the center of the zipper on the front side to make the opening. 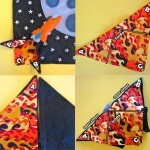 I made the triangle of flame fabric then layered it over the back of the page as described above so the zipper was in the center of the “Sandwich”. I added a picture with details in hopes of making it clearer. If it is still confusing, I can try to make a video! I was wondering how you sewed this page into your book. I made it, but haven’t put my pages together, and as I look at it I think if I zig zag all around it onto the 9×12 felt that the zipper will open, but you wont really see the flame fabric underneath. Did you have this as well? I was thinking of only zig zagging up to the flame and then lifting the black felt and zig zagging the flame fabric down. Just wondered your thoughts and if you had any pointers. Thanks and thanks so much for sharing all your patterns. They are so beautiful and I’m really enjoying making pages for my son. What you described is exactly what I did. I sewed from just above the flame fabric, up around the top and right, then again, only to the flame fabric. I then unzipped and pinned the felt flaps out of the way and sewed down the flames. Pingback: FullOfStitches.com blog. 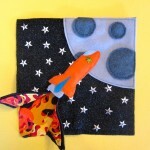 » Blog Archive » Zipping to Space! Love it! I have everything done… Except for sewing on the flame fabric. Can you give me some direction? How did you get so much flame fabric exposure when opening the zipper? If I were to sew it in right now, my zipper just goes up and down, with very little to no exposure of the flames. Did I miss a step? Help! It’s turning our soo adorable thanks to your patten, I dont want to mess it up! Another one of your fabulous pattern is done. Hi this is Shayla, I’ve been really impressed with all your work that you have done. 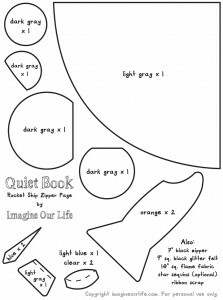 I’ve made 5 quiet book pages for my little girl, and I’m working on a sixth on right now. 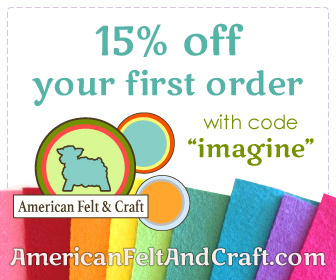 I really love working with felt, I’m an artist, and this has become a new hobby that I enjoy. I was wondering if I could sell the patterns to people in my ward, as a put it together your self kit. I haven’t done this yet, because I wanted to get your permission first. If you say no than that’s fine. What ever you decide. At the moment, my patterns are for personal use only. But I will be selling licenses to allow commercial use soon.